Planeta.com (created in 1994 by Ron Mader) is a handcrafted website maintained in old school code with a smattering of social web niceties. Our 20+year journey is shared with old school veterans and fresh, newbies alike. We invite locals and visitors to share practces of eco-friendly, people-friendly and place-friendly travel. Wiki editors are encouraged to update the relevant pages for favorite places and topics. One of our tentpole events, Responsible Travel Week manifests our commitment toward effective communication and collaboration. 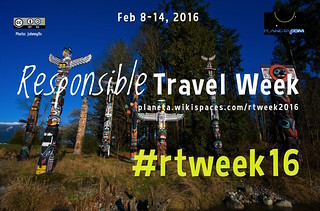 2016 is the eighth year for Responsible Travel Week and Planeta's 17th year of innovative conferencing. Registration is open, pwyw. Crowdsourced and crowdfunded, Responsible Travel Week amplifies down-to-earth applications of noble concepts including responsible travel, conscious travel and ecotourism with the inexpensive social web. Think of this as a way to move beyond silos. Responsible travel is not an ethical dilemma of whether to have fun or be responsible. We can do both! Fall in love with responsible travel and let us know your plans and level of engagement. Schedule your own event or stage a viewing party. Planeta nd GetLocalFlavor.com host a lively conversation taking stock of where the USA stands in terms of responsible travel / Indigenous tourism / ecotourism / agritourism / sustainable travel and what we would like to see improve in 2015. We spotlight community and regional practioneers and consider whether it's time for new associations / organizations / working groups. Responsible Local Travel in the USA brings together innovative people who are creating a better world. We will spotlight local businesses and organizations, directly and indirectly connected to tourism. As this is an online dialogue, we will make the most of the social web, using crowdsourced documents, surveys and video conversations to broaden the discussion. Special efforts are taken to make this as transparent and as open access as possible. Can you recommend a guest for our hangouts?